Title: "Kitten on the Keys"
Kitten is one of those performers that help make San Francisco, San Francisco. I know Kitten to be dangerously honest, she’s rumored to be deviant in her activities and listening to her music reaffirms that she is sweet in her insanity. Her skills as a pianist, ukulele player and accordionist allow her to focus on the theatrical aspect of her performances, and theatrical she is, think Betty Boop on a rant, throw in a touch of insanity, a spot of burlesque a little more than a pinch of shameless genius and you have Kitten on the Keys. 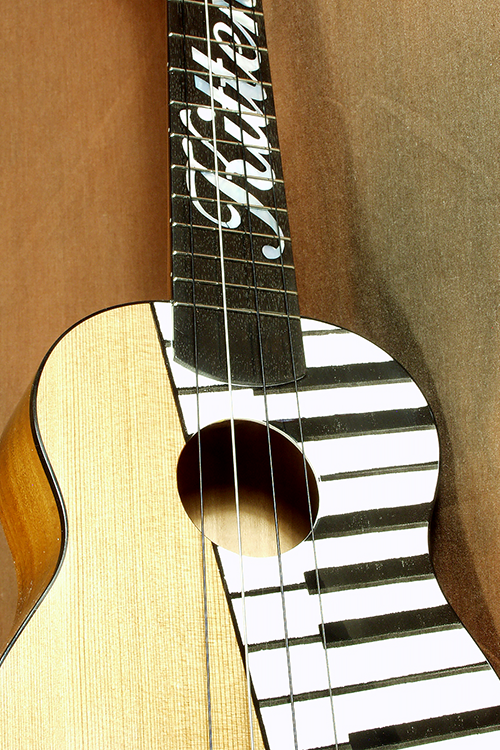 Kitten needed a killer ukulele and I was delighted to be able to make one for her. Meow, meow.